Pro Window Cleaning can perform commercial glass restoration that will leave your building’s windows appear blemish-free. In many cases there is no need to replace your windows. Commercial glass restoration can leave your windows looking brand new at a fraction of the price. Let our professionals work their commercial glass restoration “magic” on your businesses’ windows. A business with dirty or stained windows is embarrassing and may prevent potential customers from entering a business. Companies that appear to have upkeep problems or difficulties with people trespassing on their property need to have their commercial property professionally restored as soon as possible to prevent further issues. Here at Pro Window we Specialize in removing hard water stains, mineral staining, effectively remove stage 1 and 2 corrosion, oxidation, mineral deposits, calcium stains, lime stains, soap scum, acidic graffiti, oils, acid rain and many other defects from commercial glass surfaces. 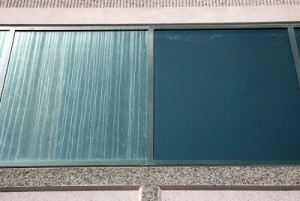 We have the ability to perform our commercial glass restoration services at the ground level. Yet we also have the ability and the equipment to perform commercial glass restoration on high rise buildings. For more information on commercial glass restoration or to schedule a restoration appointment contact us or give us a call at 816-920-6943. Don’t Forget Windows in Your Commercial Property Maintenance Schedule! Your local Kansas City window cleaning company. © 2016 - Pro Window Cleaning Services, L.L.C.